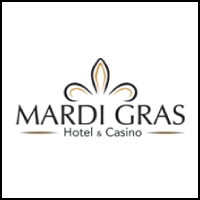 Located “Just Off the Strip, Right On the Money” the Mardi Gras is your best affordable alternative to the much more expensive Las Vegas hotels in the area. A full-service hotel with restaurant, bar, 50 slot casino, large pool deck and FREE strip/airport shuttle service (7 am – 10 pm daily). Receive 20% off using the promo code EMP2 when calling 800-634-6501 or CLICK HERE to book online.